Easy Lasagna is just that - easy! All you have to do to make this five ingredient recipe is cook sausage, add marinara sauce, noodles, and two kinds of cheese for a delicious main dish that is ready to go into the oven in about 15 minutes. 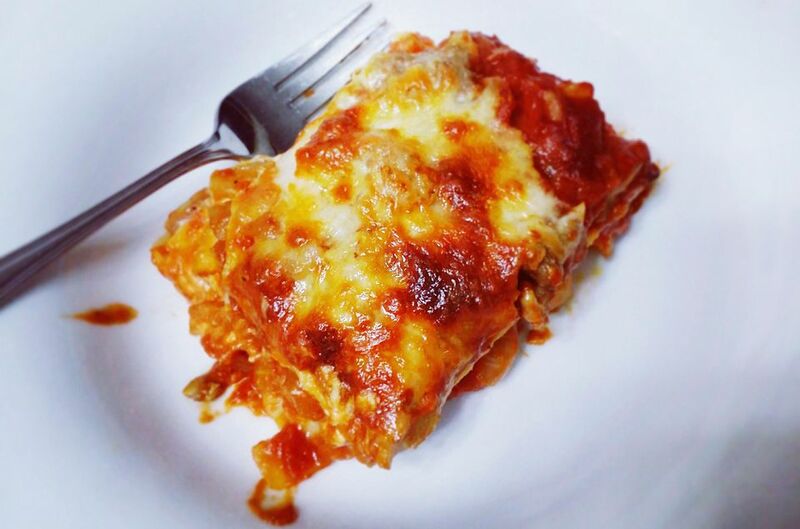 You can add 1 cup frozen spinach, thawed and drained, to the sausage mixture if you like for this delicious Lasagna recipe - this adds nutrition and color, but of course that makes six ingredients! Or you could add some onion and garlic when you brown the sausage. Or add grated carrot to the marinara sauce. The possibilities are endless! Serve this dish with a green salad, or a fruit salad made with seasonal ingredients. Add a glass of white or red wine for a fabulous meal. Preheat the oven to 350°F. Cook the Italian sausage in a heavy skillet over medium heat, stirring to break up the meat, until it is no longer pink, about 8 minutes. Drain well. Mix the cooked sausage, 1-1/2 cups mozzarella cheese and the ricotta cheese in a medium bowl. Place about 1/2 cup of the spaghetti sauce in 9" square baking dish. Top with three lasagna noodles, then with 1/3 of the sausage mixture. Repeat the layers, ending with the spaghetti sauce. Cover the dish with foil and bake for 35 to 40 minutes or until hot and bubbly. Sprinkle with the remaining 1/2 cup mozzarella cheese and return to the oven. Bake for 5 to 10 minutes longer or until the cheese is melted and browned.